Bayshore Recycling in the Keasbey section of Woodbridge Towship represents a unique brownfields redevelopment. 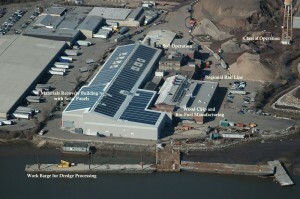 Bayshore Recycling Corporation’s facility represents a unique example of smart growth in an industrial context that brings together brownfield redevelopment, advanced recovery of materials through recycling and sustainable operations. When build-out of the 15-year development plan is completed, Bayshore will operate 100-percent “green” businesses powered by 100-percent renewable energy. 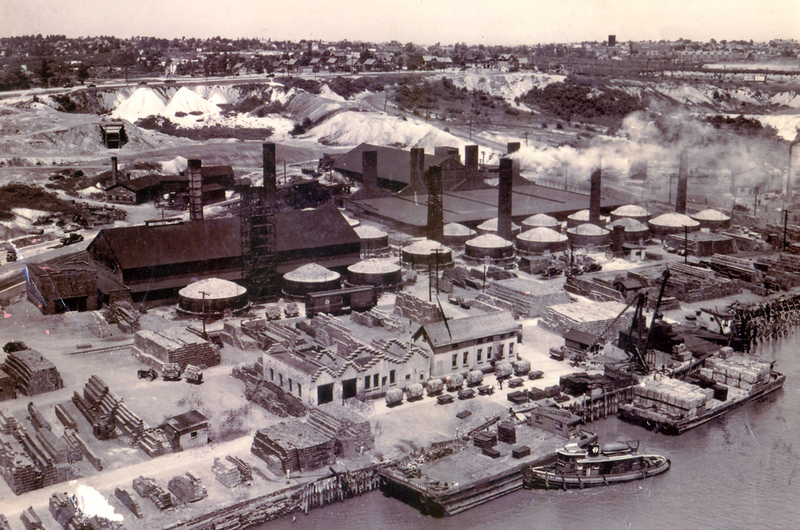 The site is located in the Keasbey section of Woodbridge, which was founded in 1882 by Anthony and George Keasbey, who established the Raritan Hollow and Porous Brick Company, later known as the Carborundum Company. Since that time, the area has remained industrial and, as a result, has historic contamination from industrial and manufacturing operations that have taken place. This is a model for how municipalities and businesses can foster sustainable industrial development that stimulates economic growth, improves community and environmental health and incubates the next generation of renewable energy technologies. Woodbridge Township has taken a strong leadership role in the revitalization of this area, securing designation of 655 acres adjacent to and including the Bayshore site as a Brownfield Development Area by the state Department of Environmental Protection. 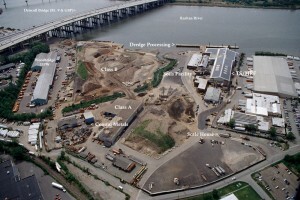 The township has put a redevelopment plan in place and committed resources toward the cleanup and development of the entire Keasbey section, seeking to establish the area as an “eco-industrial park” – an industrial system of planned materials and energy exchanges that seeks to minimize material use and waste, building sustainable economic, ecological and social relationships. Bayshore’s Recycling Complex is the anchor for this initiative. Atop Bayshore’s Materials Recovery Facility, 9,365 photovoltaic solar panels generate 679 kilowatts of electric power, supplying 40 percent of the energy needs of the low-temperature thermal desorption facility processing contaminated soils. 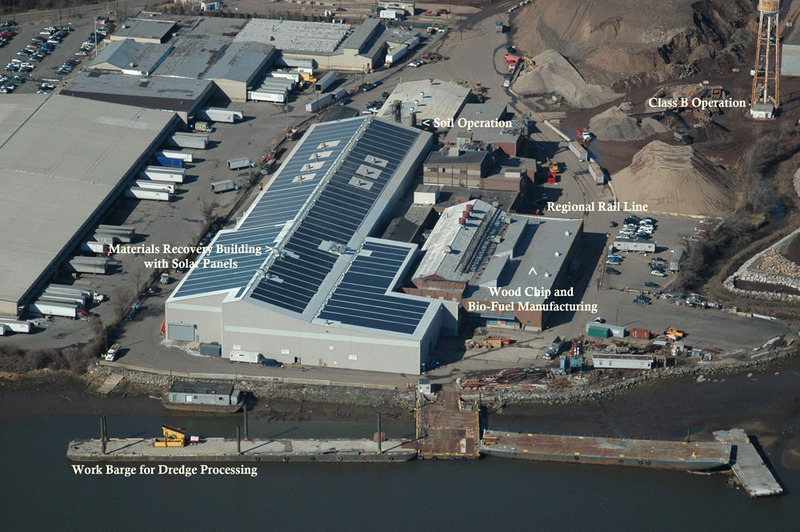 Bayshore and its affiliated companies currently operate five separate but related recycling businesses on its 52-acre waterfront site, well situated near water, road and rail transportation networks. One of the largest recyclers in the Northeast, Bayshore recycles concrete, asphalt, brick, block and glass into aggregate materials; remediates petroleum-contaminated soils; recovers and recycles mixed construction and demolition debris into secondary products, such as landscaping mulch and bio-fuel; provides full-service metals recycling; and accepts dredge material at a barge terminal on site. Atop Bayshore’s Materials Recovery Facility, 9,365 photovoltaic solar panels generate 679 kilowatts of electric power, supplying 40 percent of the energy needs of the low-temperature thermal desorption facility processing contaminated soils. All other existing or new buildings at the complex will also be fitted with a rooftop solar array as the 15-year plan is implemented. Installation of three wind turbines within the next two years will generate an additional 2.25 megawatts of renewable energy. The balance of the facility’s renewable energy needs will be met through development of on-site biomass-to-energy technologies currently under technical review. 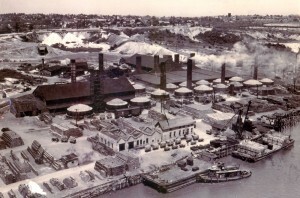 Bayshore Recycling is located on the former site of the Raritan Hollow and Porous Brick Company, later known as the Carborundum Company, founded in the 1880s. Since that time, the area has remained industrial and, as a result, has historic contamination from industrial and manufacturing operations. Bayshore’s multi-faceted recycling complex provides a model to advance materials recovery in line with the State Recycling Plan and the goal of achieving a municipal recycling rate of at least 50 percent. In addition, the state’s 2008 Energy Master Plan calls for 900 megawatts of energy from biomass as part of New Jersey’s 2020 Renewable Portfolio Standard. Implementation of on-site biomass-to-energy technologies currently under technical review at Bayshore’s facility will go a long way toward helping the state meet this standard. The Bayshore Recycling Complex is a model for how municipalities and businesses can partner to foster well-located, sustainable industrial development that stimulates economic growth, improves community and environmental health and incubates the next generation of renewable energy technologies.